I decided on a name for the blue and green roving from the last post. I decided on Toxic Mayhem…it just seemed to fit better than anything else. Today is Saturday, and we have no plans other than going out to buy a birthday present for a little cousin turning 3. Other than that, it’s going to be a rare day filled with no obligations. My excitement is hard to contain, as yesterday I received my order of bare roving, and it’s all waiting to be dyed. It’s going to be a productive day! I look forward to showing you the fruits of my labor next week! In knitting news, I’ve started yet another pair of socks. No, I haven’t finished the Lace and Cable socks yet. And no, I haven’t gotten very far on my shawl. And starting another pair of socks doesn’t really make any sense right now….but I have my knitting group to blame. We’ve decided to start a sock KAL, and our aim is to knit one pair every month, and we’re going to start with the first pair in Cookie A.’s Sock Innovation, Glynis. Then we’re going to move through the book and knit every single pair of socks in there. Now this all sounds good in theory, and I MIGHT be able to keep up if I had nothing else to knit, but that’s not the case. I have so many other projects I also want to work on, and if I did nothing but the socks, well, that would be it. It easily takes me a month for a pair of socks, and I don’t think I’ll be able to keep up with these knitting ninjas I hang out with. Even if I could keep up, I wouldn’t be able to work on anything else…so I didn’t commit myself, but I gave an honest, “I’ll try.” And so I already cast on and finished the cuff of the first sock, hoping to get a head start. I’m very lucky to have found such a talented group of knitters to play with. Now I just have to try to keep up! 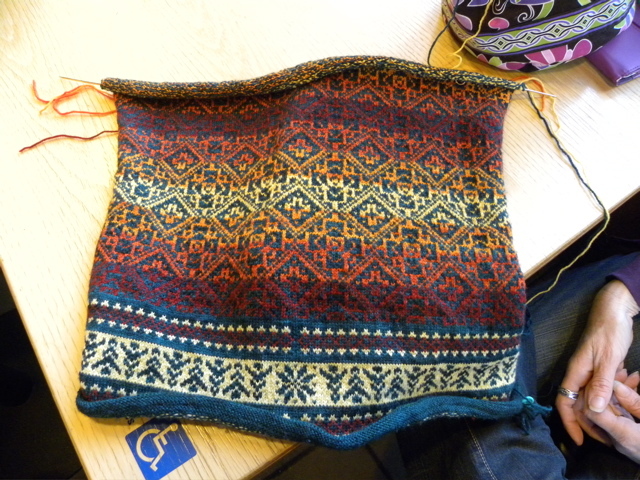 That looks AWESOME!Size 0 needles, that must take FOREVER! But so amazing looking! Thanks for sharing!